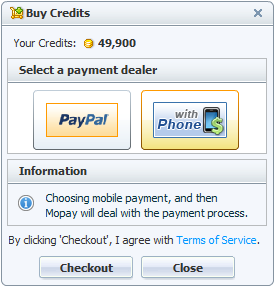 There are three payment types for users to buy chat credits, PayPal, Mopay and CashU. More payment types will be added in the future. It's the online payment. User buy the chat credits on Internet via their PayPal accounts. And they can choose the credits amount. It's the mobile payment. Users can buy chat credits via mobile phone. It's the CashU payment. 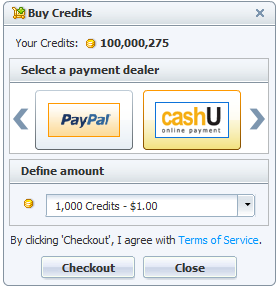 Users can buy chat credits online. 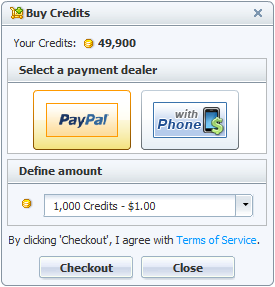 After clicking Checkout button, a new page of buychatcredits.com will be opened to deal with your payment. Note: Since 7/1/2014, Mopay payment processing will be temporarily terminated due to 3rd party API change until further noticed. Previous mopay payment record in your BCC account will stay intact and valid.